A new report says social and emotional engagement boosts learning. Renaissance Academy agrees. In 1984 Ronald Reagan stood before the nation and said America’s schools were failing. He wasn't wrong, and the journey we've taken to find a solution since then has been long, winding, and at times treacherous. Today, educators are waging war against some of the very initiatives designed to deliver us from that failure, and a new report released last week is pushing back on a philosophy of education that has for too long assumed that students' academic brains can be educated separate from the rest of their bodies. The report, “From a Nation at Risk to A Nation at Hope," draws on input from more than 200 scientists, youth and parent groups, educators, and policymakers, and says that simultaneously supporting students’ social, emotional, and academic development has a positive impact on their attendance, test scores, success in college and careers, and overall well-being. It also improves students’ feelings about school and makes schools safer. And while the Commission believes the report provides a blueprint for the next wave of advancement for our nation’s children, schools in Isabella County have already been implementing strategies to educate children beyond academics alone. One of those schools is Renaissance Academy. Chartered by Central Michigan University, the school serves students in preschool through eighth grade. 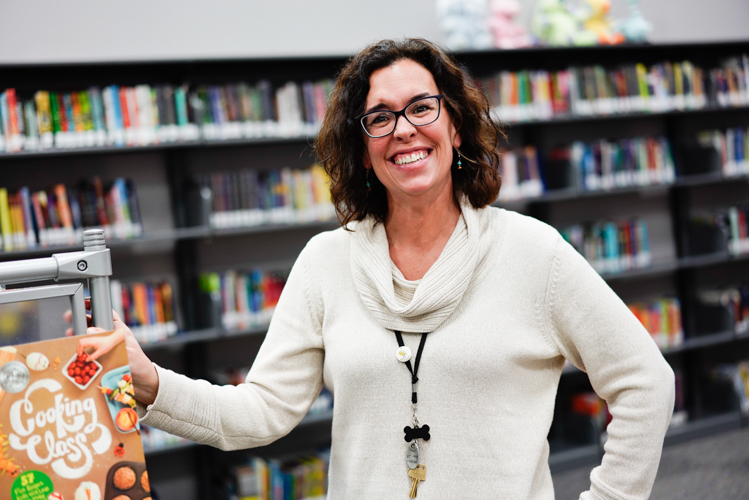 Lisa Bergman, Principal at Renaissance Academy, said that she taught in the public school system for 20 years and saw the light at the end of the tunnel when she first came to Renaissance. That was six years ago, and Bergman says that at the time, Renaissance Academy was still mostly traditional in its approach towards education. But while tests scores are going up, Bergman points out the increase is because of how they believe children should be taught, not because they’re teaching to the test. “Every kid from Kindergarten through 8th grade gets put in a squad,” she says. Each squad is made up of 10 students, all of different ages, and they spend the first 20 minutes of the day doing something fun and getting to know each other. The findings in NCSEAD’s report would support emotionally-focused education strategies like Rennaisance’s squads. 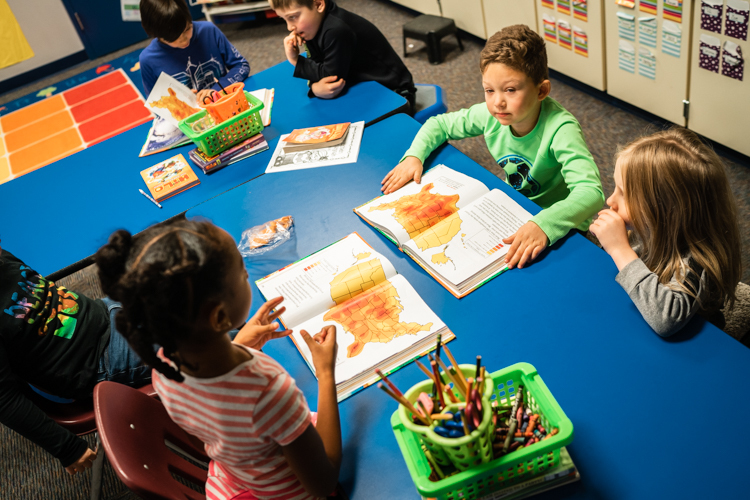 “The science is overwhelming that social and emotional learning is a booster rocket to all the things we already measure,” says NCSEAD Commissioner John Bridgeland. “Many parents worry about their children’s happiness, well-being, and achievement...we can—and should—promote all of these dimensions at once and equip kids with an array of skills they need to succeed,” said Timothy Shriver, co-chair of the National Commission and chairman of the Special Olympics. At Renaissance Academy, grade levels share a classroom: 1st and 2nd, 3rd and 4th, 5th and 6th, 7th and 8th. Some multi-age classrooms are known as “split classrooms”, where two grade levels share a classroom but are taught different things. Not at Renaissance. Bergman says the multi-age approach allows teachers an additional year to work with the same students, getting to know both the child as an individual as well as their families, and therefore build stronger relationships. “We’re not split classrooms. We teach to the top. In that two year span, we teach the kids the best of the best of what we want from them so they’re exposed to a high level of learning." 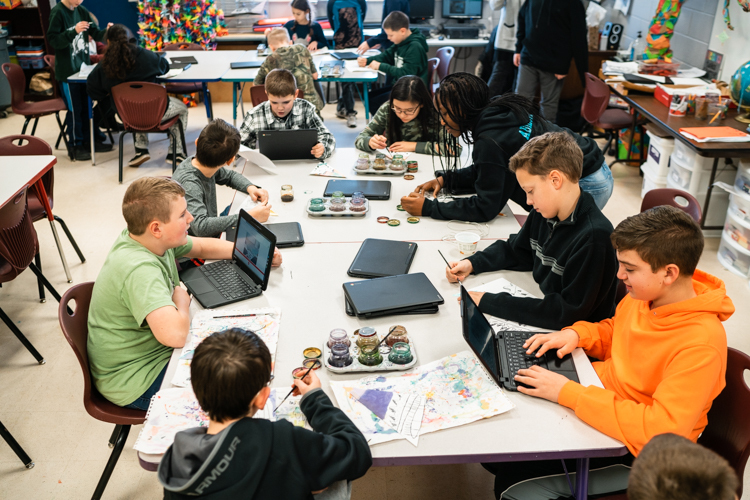 Kids crawling on the floor covered in paper mache, coloring, drawing, and cutting PVC pipe sounds like an art class, but in December, Renaissance Middle School students created their own museum as a way to learn and demonstrate their knowledge of ancient history. 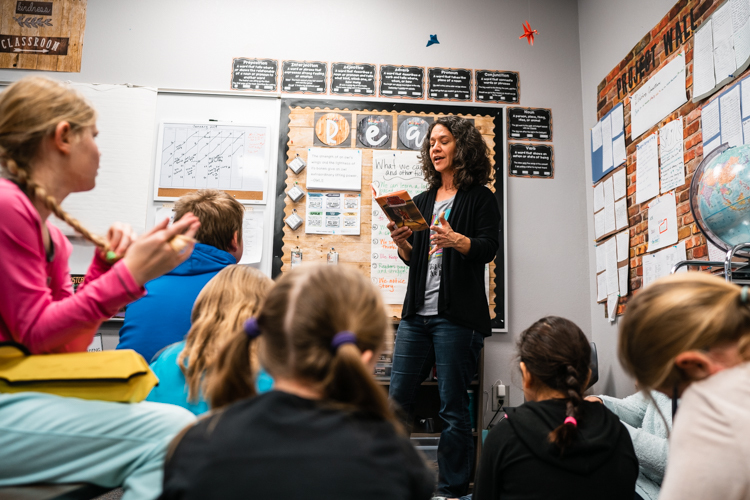 “The idea behind project-based learning is that a child’s ability to memorize things is less important than their ability to do something with that information,” Bergman says. “If they want to learn something, they can pull up a tab on Google and find the information, so [with project-based learning], we get to ask questions like, ‘Where do you get information? What’s reliable information? How do we talk about this with one another? What if Egyptian history hadn’t happened? What effect would it have on the rest of the world?'" Bergman says students at Renaissance are still taught content knowledge and balancing that with real-world applications is part of the art of teaching. The benefits of project-based learning don’t stop at subject areas like history or reading, she says, as students need to write proposals, figure out how to raise funds and gain support for the projects they want to do - everything from the history museum to having an aquarium in the hallway. The development of communication skills also extends to an upcoming art unit, where students will learn how to knit while engaging in conversations about current events. “There are some pretty strong ground rules set in the discussion, but it will be interesting to see how the kids interact with it,” she says. This emphasis on interaction and communication is supported even by the seats in each classroom. 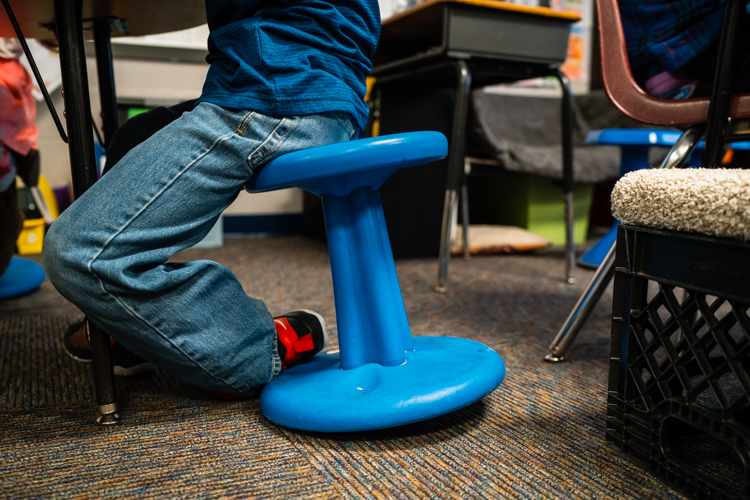 Traditional single-student desks are hard to find, as most of the seating - called “alternative seating” - are tables where multiple students are gathered, and chairs that allow students to rock, move, or adjust freely. Possessing strong communication skills and the ability to positively interact with others are two of things the NCSEAD report highlights as critical to employment success later in life. Locally, employers and community leaders agree. In order to fill strong demand for skilled employees, and continue to build Isabella county as a hub for innovation, students today need to be prepared for everything that life will throw at them. That includes reading, writing and arithmetic, but also being able to navigate working relationships, advocate for their own needs, and handle frustrations and set backs productively. Renaissance Academy just happens to be a local school that's leading the way in achieving those goals. For more on the NCSEAD's work and to download a copy of the report, as well as supporting research and call-to-action documents, visit nationathope.org. Epicenter Managing Editor Diana Prichard has served as an advisor to the NCSEAD since 2017. She was involved in drafting the report, as well as supporting documents.